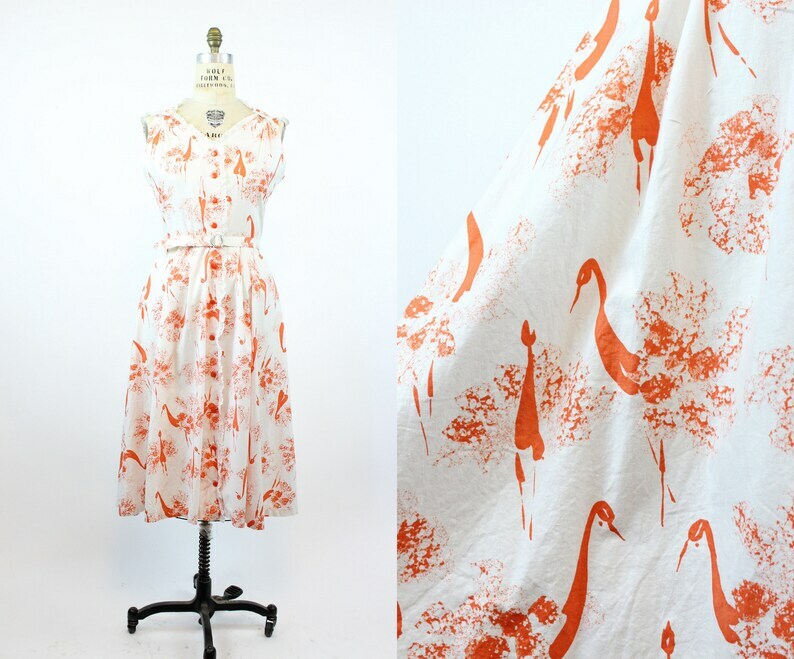 Charming 1950's cotton dress with peacocks! Done in a soft white cotton with abstract art style tangerine peacocks. Sleeveless style with faux buttons at the shoulders. Bodice buttons up with a slight V, the neckline and arm openings are pipped with a white cotton eyelet lace. This dress buttons all the way down and the cotton eyelet lace trims the buttons the whole way. A-line skirt, matching belt, dress is unlined. Condition: Excellent Vintage: very, very faint discoloring around under arms and back of neck. However, we have not attempted to remove these and they may lift right away. Some fabric is coming away from belt buckle, as pictured. Bust (underarm seam to seam) : 45"